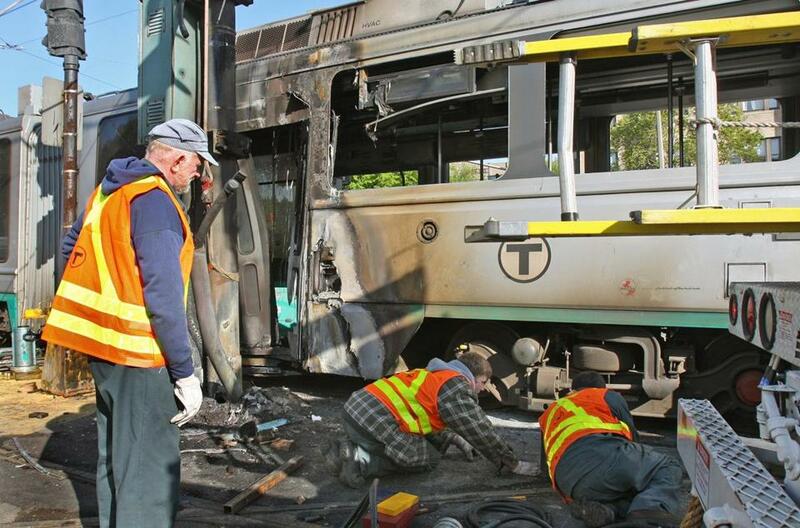 An MBTA train on the D branch of the Green Line smashed into another train in 2008. Seven Green Line trains derailed in 2015, the highest number of such accidents on light rail lines in the country, and part of a little-noticed string of safety problems on the MBTA that appear to have worsened in the past several years, state and federal records show. Five Green Line trains have derailed so far this year, including one in the past month, according to a Globe review of federal and local statistics. A spate of accidents in 2015 also led to a state audit that was quietly conducted last year. The audit, obtained by the Globe through a public records request and not previously reported, found that the Massachusetts Bay Transportation Authority was not adequately maintaining its tracks or the wheels on a type of Green Line car with a history of derailments. Over two weeks in August and September of 2015, auditors also recorded 51 instances of speeding by Green Line train operators. No injuries were reported in the derailments, and MBTA officials say they have taken a range of actions to reduce the mishaps. But the growing frequency alarmed safety specialists. MBTA workers tried to remove a derailed MBTA Green Line train from the intersection of Commonwealth and Chestnut Hill avenues in 2008. Under Governor Charlie Baker, the MBTA has prided itself on discussing the system’s problems openly. But in scores of public meetings since the audit was completed in November, the report has rarely, if ever, been discussed. MBTA officials have briefed board members in public meetings on several derailments, but not all. Paul Regan, executive director of the MBTA Advisory Board, which represents communities that have MBTA service, said the apparent lack of transparency was troubling. MBTA officials said they plan to discuss the issue at next Monday’s fiscal and management control board meeting, nearly a year after the audit was completed. The Green Line draws more daily riders than any other light rail line in the country, which could contribute to the high number of derailments. But the scope of the problem stands in sharp contrast to other metro areas. In 2015, when the Green Line had more derailments than any other light rail system, the majority of urban transit agencies had one or no accidents, according to a Globe review of federal statistics. When other forms of transit are included, such as traditional subways and streetcars, the MBTA still has a comparatively high number of derailments. In 2015, the MBTA had the third-most derailments overall in 2015, behind Philadelphia and San Francisco, according to a review of federal data. The Green Line derailments also mark a reversal of progress made in recent years. In 2007, 29 Green Line trains derailed, but by 2012 the MBTA had reduced that number to just one. MBTA officials said they have adopted a range of safety measures recommended in the audit, namely track and train maintenance and suspending speeding drivers. The audit was conducted by the state Department of Public Utilities, which helps oversee the agency’s safety functions and works extensively with the MBTA on derailments. Even when no one is injured, derailments disrupt the system, causing delays that can force thousands of riders to use shuttles or overcrowded train lines. More importantly, they can be dangerous. In 2012, a Green Line trolley derailed because a switch was in the wrong position, sending the driver and some passengers to the hospital with minor injuries. MBTA officials say the system is safe, but readily admit that the Green Line is susceptible to derailments because of a batch of poorly designed cars that make up much of the fleet. In 1995, the agency bought new Green Line trolleys from Breda, an Italian manufacturer, to comply with federal laws on wheelchair accessiblity. But officials quickly realized the new cars were highly accident-prone. In 2007, 29 Green Line trains slipped off the tracks, more than twice as many light rail derailments as any other system in the country that year. The problem, which sparked a legal battle and much public consternation, was so pervasive that the Department of Public Utilities forced the MBTA to adopt a “corrective action plan” that remains to this day. A derailed train in 2014. Under the plan, vehicle maintenance workers had to regularly grind the wheels to fit the tracks properly. Crews had to grind down the rails, as well, and tighter speed restrictions were placed throughout the system. The measures paid off, and derailments became scarce. 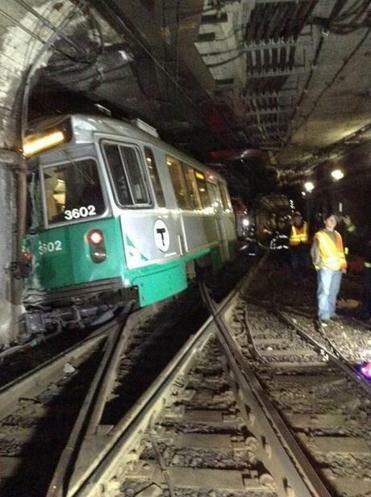 But last summer, three Green Line trains derailed within a month. 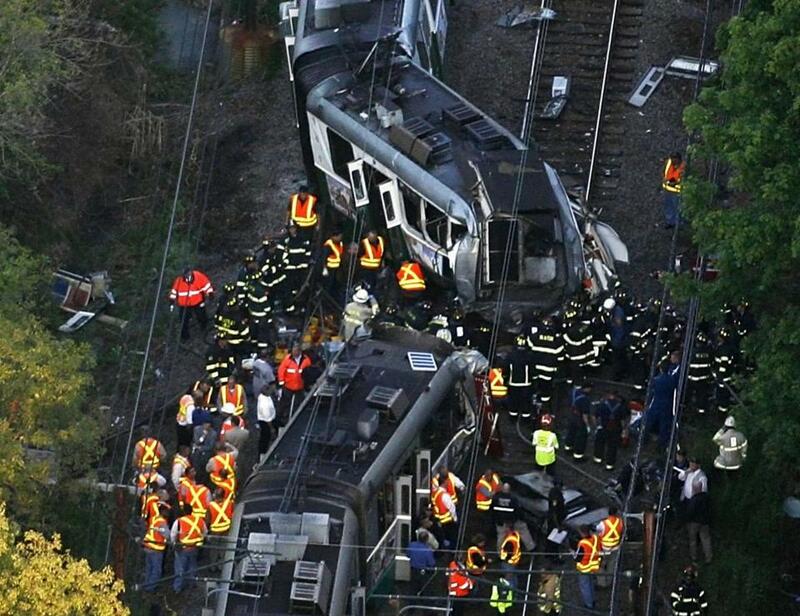 Each involved “center truck” derailments, the source of many of the accidents, and were all above ground. “We’ve been lucky that there’s been no serious injuries yet, but it has to be taken seriously,” said Stefan Weunsch, a member of the MBTA’s Rider Oversight Committee. In its audit, the Department of Public Utilities found that the derailments were often related to wear and tear on vehicles and tracks, but also cited speeding drivers as a cause. Auditors expressed concern that the MBTA was not enforcing the speed limits, especially since Green Line trains lack the technology to slow down automatically. After a fatal crash in 2008 — which included a derailment, but one caused by a trolley driver slamming into another one in front of her — federal officials recommended the MBTA adopt the automated technology on the Green Line, but the agency determined it was too expensive. The MBTA’s other subway lines have similar technology. Gonneville said they are still pursuing the technology, but it probably would not have prevented many of the derailments. Green Line drivers say they feel unfairly blamed for a system that is ill-equipped to handle trains moving at a normal speed. Multiple drivers, who asked to remain anonymous because they are not authorized to speak to the media, say they feel pressured to exceed the speed limit, which sometimes drops as low as 3 miles per hour, to stay on schedule. Gonneville said the MBTA has consistently asked drivers to obey speed limits, and even sent union officials to remind them. Since the audit, safety officials have used radar guns to catch speeding drivers. Since 2014, 47 drivers have been cited for speeding, and 24 violations have been issued in 2016, according toJoe Pesaturo, an MBTA spokesman. The MBTA hopes to use its GPS systems on Green Line trains to track their speed soon, has stepped up wheel inspections on trains that are prone to derailments, and spent four months grinding down Green Line rails in a systematic way for the first time in nearly a decade. “There’s no doubt in my mind that we’ve done everything that we can to dot our I’s and cross our T’s to identify the key issues of each one of these derailments,” Gonneville said.